A gentleman was standing on the corner ready to cross the street wired into his iPod, he crosses over and walks right into an NYC bus. In that circumstance, the driver will undoubtedly argue that the pedestrian was contributorily negligent–that is, the pedestrian was partially responsible for his own injuries. The pedestrian would argue that, even if he was paying attention, he wouldn’t have been able to get out of the way in time. However, the issue might be close enough to get to a jury (and you never know what a jury is going to do in a case like that). The pedestrian’s case gets even worse if he is not crossing at a crosswalk. Maryland’s contributory negligence law is harsh–we’re one of a very small number of states that still have this archaic rule. Basically, if the person filing the lawsuit was the negligent cause of his injuries, even by 0.01%, he cannot win a lawsuit. In other states, the plaintiff would be able to recover 99.99% of his damages. This makes sense, because the other guy had the most negligence. 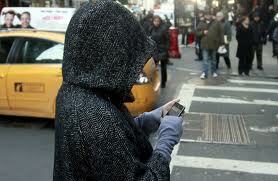 These types of laws might bleed over into non-texting scenarios. What about runners? 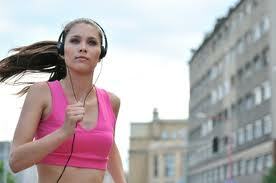 Almost every runner has an iPod or MP3 player plugged into their ears. If she doesn’t hear a vehicle, and get hit even though the driver was speeding excessively, the runner might not be able to recover for her injuries. Now, laws like this don’t always provide evidence of what’s called negligence per se. Negligence per se means that violation of the law is presumptive evidence that the lawbreaker was negligent. Whether or not that applies, the fact that the law becomes part of the public consciousness and the expectation of behavior means that an absolute defense of contributory negligence is more likely. So, whether Maryland chooses to adopt these “distracted walking” laws, the safest course of action is to walk carefully, head up, and phone tucked away. If you’ve been in a Maryland auto accident where cell phones, text messages, e-mails or other forms of distracted driving played a role, contact us at 443.850.4426, or online for a free consultation. You will speak directly to a lawyer from your first call. Don’t let your case be handed off to a paralegal.